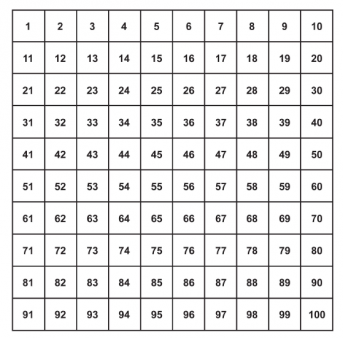 Each multiplication table has its own pattern and poses a different challenge to learners. Teacher and educational consultant John Bald offers practical strategies and ideas to help your child learn each times table and boost their confidence with multiplication. Times tables: why do we learn them? Why learn times tables? Play a little game with your son or daughter, counting up to 20 and seeing how long it takes. You might like to use a watch with a seconds hand, or a stopwatch if your child likes such things. Then have them ask you 2 x 10. When you give them the answer, they'll see immediately why we learn tables. It saves time. Early maths starts with counting, and the way we organise it almost certainly stems from our first mathematical aid, our fingers. Arithmetic is an extension of counting – learning the most efficient ways of calculating allows us to deal with larger numbers, and eventually with much larger numbers, without the slow process of moving backwards and forwards, one number at a time. In the longer term, as well as their obvious application to multiplication, we need tables for division. Division calculations begin with a large number and in effect take bites out of it, beginning with the biggest bite possible. Divide 36 by 5, for example. Knowing our tables lets us take a big bite of 7 x 5 out of it, leaving 1 as a remainder. If we don't know the tables, we need much more complicated and time-consuming procedures to cut the number into smaller pieces, with the result that division is a big weakness in school arithmetic. Algebra also uses a great deal of division and multiplication. Most of the numbers used in beginners' algebra are small, but knowing tables automatically – that is, without having to start at the beginning and count through each item – frees all our attention so that we can focus on whatever problem we have to solve. It is, though, worth going up to 12 rather than 10, as is usual on the continent. The 11 and 12 times tables are easy to learn once you know the others and lots of financial contracts involve monthly payments, so that knowing the 12 times table lets us work out annual costs without difficulty. Learning these tables also helps children learn not to be afraid of larger numbers. For a long time, and when I was at school, children learned tables by standing up each morning and reciting a full set out loud. No-one ever tested whether this was the best way to learn tables, but it seemed to work for most of the people most of the time, and is still some teachers' – and some maths advisers' – favourite method. Why does it work? Eric Kandel, who won the Nobel Prize in 2000 for his work on memory, showed that repeated stimulus (for example, through repetition) enables brain cells to grow and make new connections. My work with people who have found learning tables tricky, though, has convinced me that initial connections have to be firmly established before this process can start, and that means making sure that children really know and understand the two times table. Most children who have struggled with tables don't so much have a problem with adding two to a previous number – two, four, six, eight is simple enough to be used as a football chant – as with losing their place. "Two twos are four, five twos are..." "Two twos are four, six..." "Two twos are four, four twos are..." are just some of the examples I've heard. They involve either counting on from the last number a child has said, repeating it, or jumping straight to the next answer. On the other hand, getting the twos right establishes a pattern of understanding how one column of a table moves up one number at a time, and the other in multiples. So, if your child is having trouble with tables, time taken to build confidence with the 2 times table will often be the key to learning the rest. And if they learn them easily, the pattern can be a springboard that will make tables pretty straightforward up to twelve times – and beyond, if they really find them fun. We all love praise and most of us don't love being criticised. So, praise is most important when learning tables. My approach is always to praise an improvement, including a mistake that a child puts right for him or herself. I don't praise trying, if trying leads to an error, but I don't criticise either – I will usually just repeat the question in a neutral tone, or go back to an earlier point in a table that a child knows, and take it from there. Then I praise when the child gets the right answer, and accelerate the praise when they've really had to work to get something right. Sometimes I use a "full praise statement", pointing out what they couldn't do last week and can do this week, going on to explain how this will help them to learn the next step. It takes a bit of practice not to show impatience when a child makes a mistake, particularly if you are related to them – giving a child driving lessons is a classic example! – but it really is worth learning to do this, as it will help you in all areas of learning as well as with tables. The " um... times table"
In paired reading, child and parent read aloud together from a suitable text, and at a pace to suit the child. Once the child feels they can proceed on their own, they tap the book or the table, and the parent stops. Once the child makes a mistake, parent simply joins in again, correctly reading the misread word (which the child must repeat) and carrying on with the child. In practice, parent needs to go slowly enough for the child to keep up, and you will find the child looking closely at your face for clues. Application of the "paired reading" technique to learning tables (in other words, repeating tables out loud together) offers good practice in co-ordination, fluency and helping children not to switch between columns. Your child might well enjoy doing this with both parents. A stack of coins – at least a dozen each of 1p, 5p and 10p, and preferably two dozen 2p, will let you make up a full set of tables to 12x12 for the occasions when your child might need to go back and check by counting. No cost, beyond the time it takes to collect up the change. A pack of cards – take out the aces and Kings, count Jack as 11 and Queen as 12, and you can practise the full range of tables by dealing your child two cards and asking them to multiply them. A pack of blank cards (make them out of cardboard or paper, or buy premade versions) These are infinitely versatile. You can write down whatever items your child has problems with and make Pelmanism sets with questions and answers. (Write the questions and answers on different cards. Shuffle and turn the cards face down. The child has to turn over a card, then turn over the matching card. You can start with a small number of sets and build up.) How many card questions can your child answer correctly against the clock? Boys very much enjoy this, but so do most girls. Numicon – a system comprising a baseboard and coloured tiles of between one and ten units. Many uses in early maths, including building up tables through series of tiles. Not cheap, but I've sometimes found it makes illustrating an idea very easy, and the consistency of the tiles builds up a sense of number, so that children think, say, in threes rather than just counting. Times tables worksheets and printable games – there are loads to choose from on TheSchoolRun. Once your child has a a full set of tables, they need to practise so that they are automatic by the time they start secondary school. A light touch, coming back to those that are difficult, will help, but you should also ensure that your child learns the standard methods of multiplication and division, so that they do not be come over-reliant on doubling and dividing by 10. John Bald is an educator with forty years' experience in teaching literacy, languages and basic maths. For more information about all aspects of times tables learning and links to resources see our Times Tables hub and TheSchoolRun's Times Tables Learning Journey.